Alphasense flammable gas pellistors are available in two housing sizes: A for fixed installation applications and A or D for portable applications. The innovative design of the Alphasense pellistor range provides high quality, low power (only 190mW) and excellent poison resistance. All pellistors are housed in certified flameproof chambers. CH-A3 is a drop-in (20mm diameter) replacement to existing products with improved stability and poison resistance. 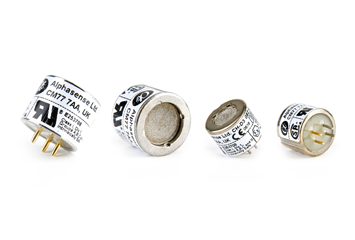 CH-D3, with the same good stability and high poison resistance of the CH-A3, is a unique miniature size, only 11.5mm height and 15mm diameter, complementing the existing Alphasense D sensor family. The CH-D3 has full ATEX, IECEx, UL and CSA certification from –40oC to +50oC at 1.25W, optimising portable gas detector battery life with a shock-proof design.